Finland’s reputation for black metal remains largely undisputed. A string of classic records from several bands since the early ‘90s, from Beherit to Sargeist, have ensured the country’s place in BM lore but what is perhaps most interesting is the glut of newer bands emerging from the rot at the same time, such as Devouring Star. A one man operation, Devouring Star straddles a black metal line that allows certain flavours of death metal in as well. The demo release turned heads with its mere five tracks but exhibited a great flair for the raw vigour of orthodox BM complemented by death metal’s heft. However it felt like a very incomplete body of work, unfinished, and unresolved. Through Lung and Heart is Devouring Star’s first real statement. The LP, working from the blueprint set forth by the demo, has morphed into a whole other entity. With just five tracks and 40 minutes of playing time, Through Lung and Heart ultimately accomplishes more in its short time than some of his peers have over several records. Often the trouble with black metal bands of this ilk is a lack of stamina, laying down a stellar opening salvo in the first track but failing to maintain such intensity by the record’s midway point and closing moments. No such issues exists on Through Lung and Heart where the dissonant and atonal black metal maintains its rich yet disconcerting vibe through. Opener ‘Desanctified Composition’ slowly unfurls with doom like touches that grow in intensity with jarring guitar tones that are reminiscent of Deathspell Omega. In fact, it’s a common comparison you’ll find on this record, with shades of DSO’s Paracletus or fellow Frenchmen Blut Aus Nord’s earlier work rearing their heads within these meandering piercing guitars. The production on this record is perfectly glossy too but not to the point of being sterile, a very difficult balance with black metal, especially of this kind. Tracks like ‘Decayed Sons of Earth’ are spacious and sprawling with stunning riffs that blossom in grandiose fashion, like how all great black metal should, while the juddering hail of blastbeats maintain that coarse stifling feel. It’s a real master class in dynamics. Meanwhile, ‘The Dreaming Tombs’ is more of the breakneck variety black metal (with a peppering of DM) that gives the album its really vicious streak. 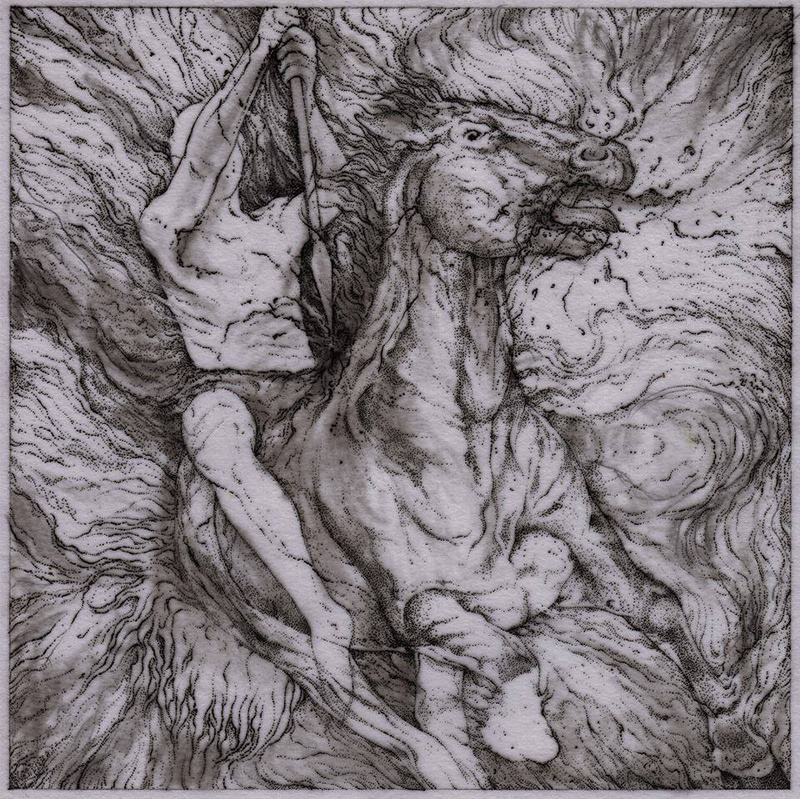 But for a prime example of Devouring Star mounting all its might, you need to take in the album’s closing title track, a mesmerising trek of black metal twists and crushing turns. It feels like we’re living in a sort of golden age of new black metal as the standard has reached some new dizzying heights now, especially with the emergence fresh hotbeds in Iceland and France but Finland certainly won’t be left behind and Devouring Star’s first LP is overwhelming proof of that. Tags: Devouring Star, Through Lung and Heart. Bookmark the permalink.